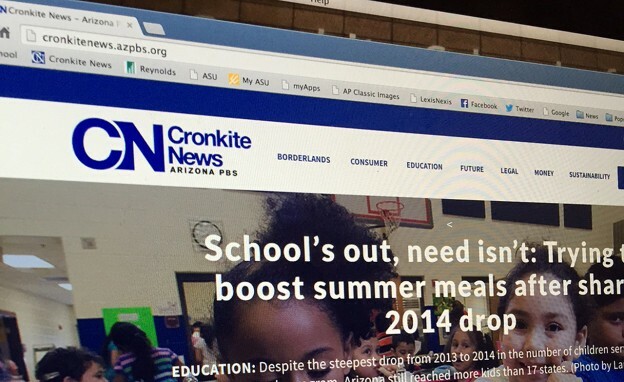 The redesigned Cronkite News website launched on May 18, 2015. It was the first redesign since 2010. Photo by Mike Reilley. Save for propaganda, I can pretty much vouch for the rest of that quote based on my experience building websites for the past two decades. "I always tell my students that I’m a bit of a mad scientist, someone who’s not afraid to experiment with new concepts and tools." So it was no surprise that the first charge from my bosses was “build a new website for Cronkite News” when I started in January as the first digital production bureau director at Arizona State’s Walter Cronkite School of Journalism. 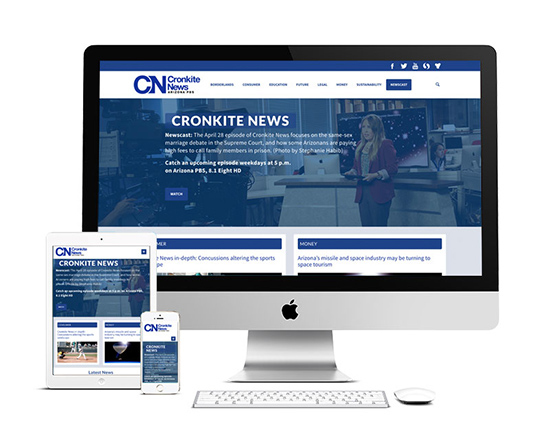 Four months later, we launched the new, mobile-friendly version of Cronkite News, the first redesign of the Arizona PBS news division’s site in five years. It launched in mid-May, and mobile/tablet traffic has already increased from 9 percent to more than 40 percent. But it wasn’t easy dropping a digital production team – and a shiny new website – into the middle of a news operation that largely served as a TV broadcast newsroom and client-driven news service the past several years. There were challenges, but in the end, we built a product that gives Arizona readers a visual multimedia presentation that the market had never seen. We have more than 100 students working at Cronkite News in the fall and spring semesters, most housed in our downtown Phoenix bureau but some in our Washington D.C. bureau and our Los Angeles sports bureau. The students cover multi-platform stories in the seven verticals established by our dean, Chris Callahan: Borderlands, Consumer, Education, Future, Legal, Money and Sustainability. There’s no simple blueprint to building an innovative website or multi-platform newsroom. But I hope this list of tips will help other journalism schools that are shifting to a “teaching hospital” model and experimenting in their newsrooms. 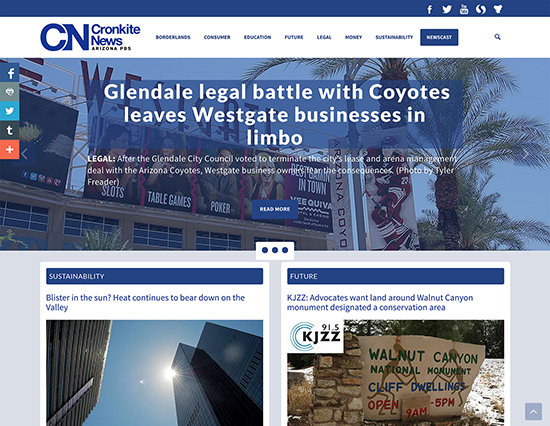 The redesigned Cronkite News site features a rotator that’s clickable on desktops and laptops, and has swipe navigation on tablet and mobile. This first tip may sound contradictory, but it’s actually a delicate balancing act of communication and quick decision-making. Callahan formed a five-person web redesign committee that determined the creative direction of the site. But the group didn’t work in isolation. My digital production bureau students were involved from day one, working on design concepts and navigation as well as figuring out how to better present our news program, Cronkite News, which appears weeknights on Arizona PBS during the school year. We also involved our fellow Cronkite News directors at weekly meetings, where we discussed design, strategies, social media, SEO, cross-promotion and other aspects of the news brand. Always be open about changes as you’re implementing them. Beyond making the site more mobile-friendly, we wanted to better showcase the Cronkite News broadcast on the site and expand our data visualizations. Our digital production bureau teamed with reporters to build the visualizations, and one of our students suggested featuring the news program on one of the slides in our home page’s top rotator. Broadcast professor Melanie Alvarez and Associate Dean Kristin Gilger helped us develop a TV schedule at the bottom of the home page that highlights the Arizona PBS 2.5-hour news block. The digital team used responsive design with Bootstrap so the site would work and look great on desktop, laptop, tablet and mobile. Photo courtesy Kevin Brown Designs. If you’re not thinking mobile, you’re dead. It’s something we hear at conferences all the time. So when we rebuilt the site, we knew it had to not only look great, but also function well on multiple platforms. That’s why we went with responsive web design rather than an app, so it could work anywhere. And we continue to build our mobile strategy beyond just the design, looking at various ways we can package public affairs stories that appeal to the on-the-go audience. Callahan helped us tailor our daily news meetings to be multi-platform discussions. We switched from using our client news budget for website planning to an internal Google Doc that was updated throughout the day. This spurred more lively discussion at the morning meetings about how to package stories visually. This was a landmark move not only for the new website and digital platforms we were building, but also in shifting the newsroom culture. Our biggest challenge moving forward remains geography. Our digital production bureau is on the second floor, and the main newsroom is on the sixth. That seems like worlds apart, particularly on deadline. My goal for the upcoming year is to somehow find room in the main newsroom for digital production. This issue is not unique to Cronkite, and I’ve heard from many colleagues in professional newsrooms who are dealing with geography amid cultural transition. I require all of my students to write weekly analytics reports that we share with the directors. We measure web traffic and social media, and use many tools to analyze how our social media accounts are affecting traffic. If you aren’t requiring this of your students now, start this fall. Costs are low. We use free Google Analytics, Facebook Insights, YouTube analytics and Twitter analytics in the weekly reports. We also use a paid version of Chartbeat to measure web traffic in real time. Social media analytics tools such as Moz, Tweepsmap and Tweriod give our students and faculty insight into followers and their behaviors. We use the analytics to look for trends. We’ve found that many of our stories about the Navajo Nation are shared heavily on Facebook. Our sports business and sports medicine stories are among our most-shared on Twitter. This insight gives us new perspectives when we enter news meeting discussions with our students. I co-drafted a social media strategy with broadcast colleague Heather Dunn. As we built out our site on a development server, I wrote a primer for students and faculty directors while we were constructing the site. This helped in training new students and faculty. All it takes is a Google doc, and it’ll pay off. I always tell my students that I’m a bit of a mad scientist, someone who’s not afraid to experiment with new concepts and tools. I often team with our instructional technologist, Nic Lindh, to try new tools and storytelling platforms. Dunn and I paired our students to create interactive videos using the Touchcast iPad app. Knight Lab tools such as StoryMap and Timeline JS were used almost daily, even on day-turn projects. We built data visualizations in Tableau Public, Google Chartbuilder and Datawrapper. We built interactive quizzes, designed dozens of static infographics and built maps in Google Fusion Tables and CartoDB. Some projects turned out better than others. But with each graphic or experiment, we learned something. And our learning is far from done. 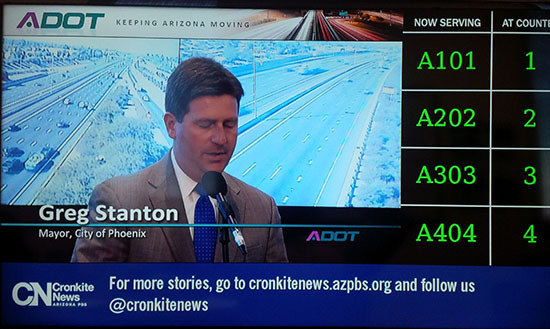 This summer, we worked with the Arizona Department of Transportation to feature Cronkite News branding, headlines and web links on video displays at DMV locations throughout the state. Waiting times often extend beyond an hour, and DMV visitors surveyed said they want news while waiting. Now they have it. By fall, a closed-caption version of our Cronkite News broadcast will air on the boards. Our headlines also run on a ticker on our downtown building. We hired Eric Newton as the innovation chief for Cronkite News. He’ll work with our directors and students to think through creative new ways to reach our audience. So what’s our next innovation? Beats me. We have an entire school year to figure that out. Mike Reilley, the Cronkite News director of digital production and professor of practice at Arizona State’s Walter Cronkite School of Journalism, has spent more than a decade teaching digital fundamentals to college journalists. His students work for ESPN, Sports Illustrated, the Washington Post, Arizona Republic, The Associated Press, Miami Herald, Chicago Tribune, NBC News, The Food Network, Variety, Hearst Television and GateHouse Media. A former LA Times reporter and Chicago Tribune web editor, he founded and edits The Journalist’s Toolbox research site for SPJ, and serves on the SPJ board of directors. He previously wrote about data journalism for EducationShift. Tweet him @journtoolbox.